As children, they formed a special bond, growing up in the small town of Ames, Iowa. As young women, they moved to eighth different states, yet they managed to maintain an extraordinary friendship that would carry them through college and careers, marriage and motherhood, dating and divorce, the death of a child, and the mysterious death of the eleventh member of their group. Capturing their remarkable story, The Girls from Ames is a testament to the enduring, deep bonds of women as they experience life’s challenges, and the power of friendship to overcome even the most daunting odds. 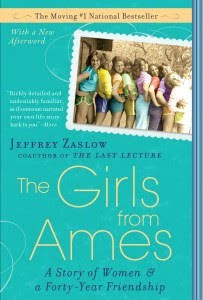 The girls, now in their forties, have a lifetime of memories in common, some evocative of their generation and some that will resonate with any woman who has ever had a friend.The Girls from Ames demonstrates how close female relationships can shape every aspect of women’s lives-their sense of themselves, their choice of men, their need for validation, their relationships with their mothers, their dreams for their daughters-and reveals how such friendships thrive, rewarding those who have committed to them. With both universal events and deeply personal moments, it’s a book that every woman will relate to and be inspired by. Check out the website for The Girls from Ames. Meet the girls and see all their photos HERE. If you have read my other reviews, I am sure you know I am not a fan of introduction pages, but I feel it necessary to read them when I am doing a review. I am glad I read it this time, as it gave me insight to more information that I would not have known otherwise. I am now a fan of introduction pages, and if you do not read them, I challenge you to do so! The same holds true for the acknowledgements chapter, I normally do not read those as well, but in this case, I am glad I did also! I enjoy scrapbooking my stories, a lot! With this book, the author took the girls personal stories and scrapbooks to create this book, so for that reason I was equally excited to read it! With this book, it doesn’t matter if you have 11 friends like these girls, or if you have 3 or 4 in your group, you can relate to the ladies and in one capacity or another, and by the end of the book you can see yourself in one of the girls! Then to watch the original girls all with their own girlsâ€¦making it the second generation was neatâ€¦ The times they would get together after high school to help on or another outâ€¦ I could keep listing parts in this book that is my personal favorite, but instead will let you find YOUR own! Most of the time as we are teaching our children about life, we are not teaching them about what is in front of them at times. One of the fathers taught his daughter about the law of averages, and how their lives would never be the same again after graduation, and how that holds true in my own life. There are 3 of us that have been friends since junior high, and I am not sure if I would know what to do with either of them. Arlene has helped me out of more binds than I know what to do about and Cindy she’s been there for me where I thought nobody else was.but the three of us, could have easily been Sally, Sheila or Karla. This book showed me it doesn’t matter if it’s Ames, or Kearns true deep friendships run deep, always have and always will! You truly will laugh at times, cry at others and want to be right there when they are all together having a good time. If you were born around the same time, you will reminisce about your own past, and the times in your life you spent with your friends. I have wanted to read this book since it came out. Being an Iowan and living 30 miles from Ames, it should be an accurate story of Iowa upbringing!!! Thanks for the hopes of winning!! This book sounds wonderful! Thanks for the wonderful giveaway. Iowa is in my blood!